Animals rescued by TCWR are private pets, mascots, performance/exhibition animals, or part of the cub petting industry. These big cats start out cute and cuddly but grow large fast and take a lot more care and feeding than an untrained individual can provide. 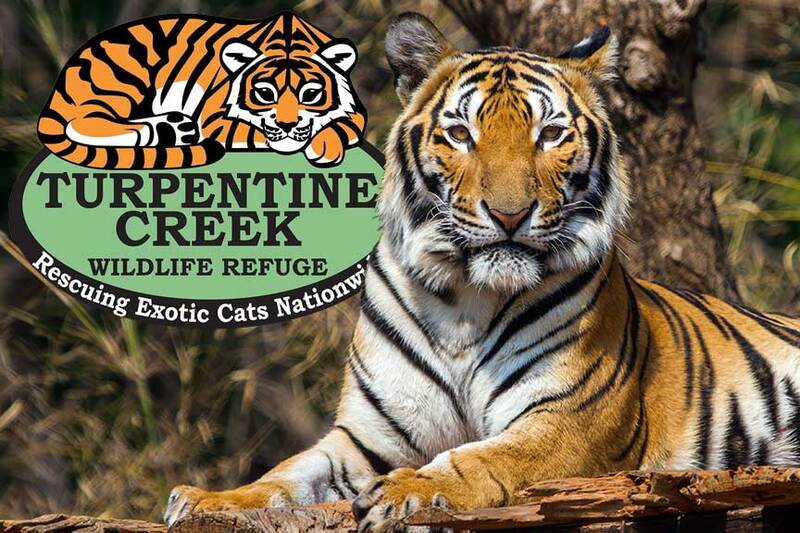 Turpentine Creek Wildlife Refuge houses the animals they care for in large, natural habitats, provides specialized diets, and on-site veterinary. They also work hard to keep current. Anyone who has been to TCWR previously might be surprised by changes in how the facility operates. This is because they’re always working to stay well ahead of the curve when it comes to current science on how to properly care for these animals. Turpentine Creek Wildlife Refuge is located at 239 Turpentine Creek Lane, Eureka Springs, AR. Winter Hours are 9am to 5pm. Summer hours are 9am to 6pm, with the seasonal switch occurring every year at Daylight Savings Time. The refuge offers a variety of tours, some of which are seasonally dependent. Guided Walking Tours are available year ’round but Guided Trolley Tours are only available during the Summer season. TCWR also offers some special and exclusive tours. Coffee with the Curator will take you behind the scenes of the refuge for an in-depth look at the lives of the animals and the work done. This two-plus hour tour includes coffee, muffins, and is lead by either the main or an assistant curator of TCWR. The Carnivore Caravan Tour is a behind the scenes look at TCWR with a senior animal care staff member. See all of the animals, the animals’ kitchen, vet hospital, and Rescue Ridge, which is usually off-limits. The facility is also home to a number of special events throughout the year. Learn about these events, tours, how to visit, donate, and more at the Turpentine Creek Wildlife Refuge website. You can also follow them on Facebook. No matter where you go in Arkansas, you can bet there’s a warm and welcoming Arkansas bed and breakfast nearby. The best Arkansas B&B’s offer amazing amenities, bountiful breakfasts, and an insider’s knowledge of what to see and do in their area. Book your stay at an Arkansas Inn today!